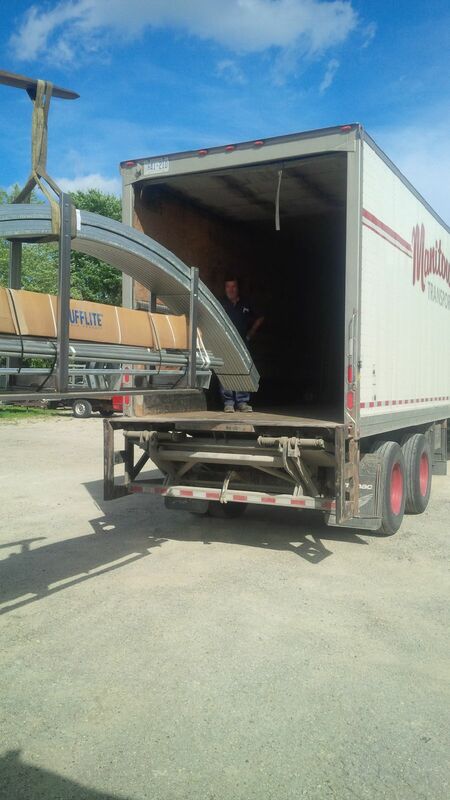 Multi Shelters offers a variety of shipping options to save our customers money on their buildings. First and foremost, we offer shipping with our truck wherever possible. We have been shipping out to eastern Canada with our truck for the last couple years. We can save you even more money with our Multi Shelter Solutions truck! We also have a shipping crate that makes longer distance shipping with Manitoulin Transport more cost effective. Shipping longer distances with our new shipping crate certainly has added possibilities while maintaining quality, convenience and economy. An added dimension is the rail service that Manitoulin Transport offers to Winnipeg, Edmonton, Calgary and Vancouver. By going via rail to Winnipeg and then road to Saskatoon, a recent customer is saving $400 on his freight bill. Did you know that in many cases the difference in the exchange rate between Canada and the U.S. pretty well covers the freight? In most cases for the north eastern U.S. the currency exchange is about equal to the freight. We have started to ship a few buildings to the U.S. and look forward to helping more people find their shelter solution. Still made and manufactured in Palmerston, ON. Come see us at a trade show near you! We look forward to seeing you out!